The legacy of the 1990s V-cinema industry is largely represented by directors: people like Takashi Miike, Shinji Aoyama, and Hideo Nakata, who got their start directing low-budget straight-to-video movies. Some of the producers they worked for, however, also made their impact felt and continue to create outstanding films to this day. One of those is Yoshinori Chiba. In those years of quick-cash filmmaking, Chiba's films stood out from the pack of genre flicks for their unconventional takes on genre and solid dramatic weight: Fudoh: The New Generation (directed by Takashi Miike), Another Lonely Hitman and Onibi: The Fire Within (both by Rokuro Mochizuki) still count as three of the best films made in Japan during that particularly fertile decade. How did you originally get your start in cinema? I began as an employee of the distributor Gaga Communications. They had a production division as well, but I started out in the advertising department. Things began to change after I met the director Keita Amamiya. I produced his movie Zeiram, with money from Gaga. But my background is in advertising, so I've always kept a knack for selling my films. I guess that would go for Zeiram, since it was distributed in quite a few countries at a time when that type of Japanese low budget genre movie was still relatively unknown. That's true, it was quite successful. In Japan and abroad. That experience made you decide to continue as a producer? I was still just a salaryman at Gaga, an employee. I had to work with the money Gaga gave me and had an obligation to my superiors to stay on budget. The budget for Zeiram was half a million dollars, but the final amount we spent on it was almost twice as high, close to one million. On my first film, I broke all my promises and lost control of the budget. I was nearly fired, so you can imagine they weren't too eager to let me produce again. I went back to the advertising division for a few years. Around that same time, Shinya Tsukamoto broke through and the V-cinema boom started, but it took me a while to get another shot at producing. The next film I did was with Takashi Miike, Fudoh: The New Generation. How did that one come about? It was a Gaga production. The company had had a few straight-to-video hits and they wanted to start producing films for the video market regularly. The main genre at the time was the yakuza movie, which is why they decided to do an adaptation of the manga Fudoh. What were your own viewing habits at the time? Did you like yakuza films yourself? I've always loved horror movies, zombie movies especially. I always wanted to make a science-fiction movie, but they're very risky. You need a lot of special effects and it can quickly spiral out of control. I experienced that myself on Zeiram. The company ordered me to make something profitable, which meant it had to be low-budget. I had no interest in the yakuza genre at all, but it was the trend at the time and I didn't have much of a choice. I figured that I could do something strange and unusual even with a yakuza movie, so that's what I did with Fudoh. There was the main yakuza-type story, but I gave it a very weird slant, a different flavour. What was your impression of Miike at the time? What were your reasons for choosing him to direct Fudoh? I'd seen his films and had a meeting with him. During that meeting I could tell he was a strange guy (laughs). He was really unlike any other Japanese director, so I was convinced that this guy could turn the movie into something really special. I could trust him to not just churn out yet another yakuza movie. It's quite well known that the film was originally meant for video but that it was decided to release it theatrically instead. Could you explain how exactly that came about? I was watching the rushes and I was blown away by how good they were. It was even better than I hoped it would be. Back then, all straight-to-video films were still shot on film, but they rarely made 35mm prints, because there was no need for them. They went directly to video, so all they made was a video master tape. But Fudoh was coming out so good - good enough to play on the big screen - that I decided to have a print made. There was no room for this in the budget Gaga had given me, so I tricked them into giving me more money. The Tokyo Film Festival has a fantasy film sub-festival. I told my bosses that Fudoh had been selected for the festival and that we needed to make a 35mm print. I was lying of course (laughs). Actually, I submitted it to the Tokyo Film Festival after we made the print, but they rejected it. They thought it was too violent (laughs). When we later submitted the film to Eirin, the Japanese ratings board, they said it was the most brutal and bizarre movie they had ever seen. They were almost angry with us for showing them this film (laughs). I think those people have had the same experience with Miike films several times over since then. (Laughs) Yes. Those Eirin committee members are all old men. They can't take something like Fudoh. They'd never seen anything like it! With video releases it was easy back then, there was no rating. But since we wanted to release it in theaters, we had to deal with them and they're very strict. After Fudoh you made several films with Rokuro Mochizuki, including Another Lonely Hitman and Onibi. Those were somewhat more conventional yakuza films than Fudoh, so what attracted you in those projects and in Mochizuki? Miike's methods are extreme, the way he shows violence and absurdity. Mochizuki, on the other hand, has a different taste. He's not afraid of violence, but he has a more dramatic, almost art house-type sense of filmmaking. It was fun for me to work with two such different views within the same genre. Another Lonely Hitman starred Ryo Ishibashi, who at the time was of course already very well known, both for his acting and for his music. Was the project mounted as a star vehicle for him or did he join the project later? Ishibashi had been working as an actor for a while, but at the time he was hesitating between continuing as an actor or concentrating on his music career. I had the project and chose Mochizuki to direct, because I felt his sensibilities would fit the story and the characters. Similarly, I thought of Ishibashi for the lead role, because the story had the potential to be very different from a standard yakuza yarn. Then when Mochizuki and Ishibashi met for the first time, they got along very well, there was a real chemistry between them. And then of course there was Onibi, which is a kind of companion piece to Another Lonely Hitman. It's a similar story by the same writer, another experienced star in the lead, the same director. Was it your plan to do a kind of follow-up to Another Lonely Hitman? Since Another Lonely Hitman had done well, I spoke with Mochizuki about doing another film. I received the script for Onibi and thought the story was great. We showed it to Yoshio Harada, who also liked the script and we went into production pretty soon after he accepted to play the lead. Onibi was still a Gaga production. When did you finally leave the company to become freelance? I left there in 1998 and started my own company called Media Suits, together with a partner. At Gaga I'd been involved in close to 60 films and I was getting tired of it. I felt that all I was doing was churning out my quota. They had an annual budget and every month they decided "Okay, this month we need to make two films, next month three". It was only about the numbers. They didn't care if the films were good or bad, as long as the product was getting made. I was expected to make the prescribed number of movies, and my own interests and opinions never figured into it. It was purely a job and that's how I began to feel about it. I didn't feel I was creating something. I even considered getting out of the movie business entirely at one point. What were you thinking to go and do instead? I had no idea. That's why I eventually decided to continue. I have no idea how to do anything else (laughs). Gaga's attitude was kind of symptomatic for the V-cinema industry as a whole, wasn't it? It has always been about quantity. Yes, that's true. It was always about numbers. The market overflowed with boring yakuza movies that were all the same. In recent years V-cinema has been getting more and more competition from video games and mobile phones and so on. It's no wonder the market and the quality of the films have gotten worse. It's very much a niche market, by nature. So you always get the same types of films. The movies were always about yakuza or naked women or gambling. It's narrow and doesn't get any larger. Mobile phones and video games have only become bigger and bigger, they had room to expand. V-cinema just continued to cater to the same audience. Who would you say was the main audience for V-cinema films? We never figured out who our audience was. The only people we dealt with were the representatives of the video stores. We were never in touch with our audience and we never bothered to find out who they were or what they wanted. It was the middle-aged men who worked for the video rental chains that decided what kinds of movies were bought and consequently what kind of movies were made. The distributors and producers never knew who was actually buying or renting their films. So there was never any kind of market research on the part of distributors? Nothing at all. Once the videotapes had left the warehouse, it was out of our hands. At least when your film is in theaters, you can go see for yourself who your audience is, but not with video. That was a big problem too. We never got any response from the audience about what they liked and what they didn't like. It was always about making a movie with Riki Takeuchi or Sho Aikawa, because it was guaranteed to sell a certain amount of tapes. As long as the numbers added up, the companies didn't care about what the audience wanted. Can we safely assume that the main audience for V-cinema was men in their thirties and forties? Yes, I think we can. That's why the market never expanded. If your audience is teenagers, you're dealing with people who grow up and develop into different directions. There is room to expand and diversify. But if you're dealing with middle-aged men, you don't increase, you don't expand. Everything stays the same. Could a rough division in markets in Japan be as follows: video is for men, TV is for women, cinema is for kids and teenagers? What, according to you, has the value of V-cinema been for Japanese cinema as a whole? What impact has it had? Out of all the V-cinema movies that were made in the 1990s, 80 percent were junk. There is no interest there whatsoever. But the remaining 20 percent were quite diverse, interesting films made by talented directors and with promising actors. To discover those talents, people like Kiyoshi Kurosawa, Takashi Miike, and Shimako Sato, that 80 percent was a meaningful investment. Those talents had a chance to make films and to develop an audience, a fanbase, and critical support. V-cinema was a learning curve for them, so in that sense it was crucial. Creating your company Media Suits must have really been an escape from the V-cinema mentality for you. Yes, that's very true. But I still believe in offering opportunities to talented newcomers. I still prefer to let a young up-and-comer direct one of my films instead of a veteran. I recently produced The Neighbour #13 and Death Trance, and both those films were directed by first-timers. It was the same with Battlefield Baseball before that, which was Yudai Yamaguchi's first job as a director. When I worked with Miike he was relatively new, Mochizuki too. It's much more enjoyable and motivating for me to work with new talent. When I see that their work is accepted and appreciated, it's a great source of joy. I really enjoyed The Neighbour #13. 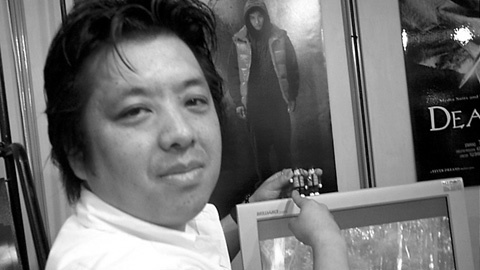 Where did you find the film's director, Yasuo Inoue? He was with a filmmakers' agency, making music videos and TV commercials. I noticed that he had a sensibility that I felt would fit well with the project. His style on The Neighbour #13 is very different from most music video directors. They usually tend to be really flashy, but Inoue's style is much more sparse, distant, observing, almost low-key at times. Actually, the result of The Neighbour #13 surprised me. I knew he could do a good job, but I didn't expect it to be as good it was. I was very pleasantly surprised. Inoue told me that he wanted to make the film as realistic as possible. He believed it would give the film much more depth. I didn't understand what he was getting at until I saw the finished product. In that kind of situation, where a director has a different vision from you own, how much leeway do you allow him? How much control do you exercise over him and over the finished film? With these new directors, there's not much existing material to evaluate them. When I select the director, firstly I base my opinion on their personality and the chemistry I have with them. I've made so many films and worked with so many directors that I can tell whether a director is someone I can work with or trust or who can take the material into new directions that I can't imagine. Once I've made my decision and shooting starts, I step back and let the director do what he does. I rely on that chemistry. It's about more than just talent. The talent you can only measure once the film is finished. Personality is the key. I'd like to continue working with young directors. I also want to stick to what I've always done, which is to make something that is different from rules or genres. We have the major studios for mainstream entertainment, so I'll just concentrate on doing my own thing. The response and interest my movies get at film markets around the world tell me I'm doing the right thing.